The third SBIRS satellite, the next satellite scheduled to join the U.S. Air Force’s Space Based Infrared System (SBIRS), pictured above in final assembly and test at Lockheed Martin in Sunnyvale, California. Credit: Lockheed Martin. WASHINGTON — The U.S. Air Force’s Space and Missile Systems Center has cleared the third missile-warning Space Based Infrared System satellite for launch following an investigation into the satellite’s engine. 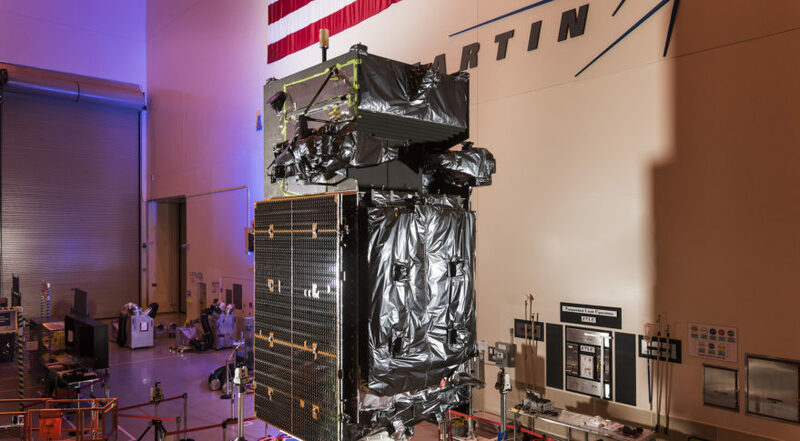 The launch of the Lockheed Martin-built satellite was originally scheduled for Oct. 3, but was pushed back when a supplier told the company they had an issue on an unrelated satellite with one of their engine components, a part that was also used aboard SBIRS. “On Sept. 6, Lockheed Martin was notified by their supplier that the same type of [Liquid Apogee Engine] that was installed on SBIRS GEO Flight-3 had experienced an anomaly on a different, non-SBIRS satellite,” the Air Force said in a statement. Neither Lockheed Martin nor the Air Force have identified the supplier, or specified what exactly was the issue with the component. Lockheed Martin indicated they did not build the space vehicle that suffered the engine anomaly, which would rule out the Navy’s Mobile User Objective System-5 satellite that experienced propulsion problems in June following launch and took almost four months to reach its assigned orbit. The investigation concluded Nov. 30 and the satellite has been approved for fueling operations Dec. 6–11 at Cape Canaveral, Fla. Launch is currently scheduled for Jan. 19. SBIRS GEO Flight-3 will be the next element of the Air Force’s missile-warning constellation designed to replace the aging Defense Support Program satellites. The first two satellites in the $19 billion constellation launched in 2011 and 2013. The constellation is currently controlled from the SBIRS Mission Control Station at Buckley Air Force Base in Aurora, Colorado. Lockheed Martin also celebrated the Air Force signing-off on an upgrade to the SBIRS ground control system that collects data from SBIRS and DSP satellites as well as missile-warning satellites in elliptical orbits. “The Block 10 system includes upgrades like faster collection times, improved threat detections and improved target tracking and infrared information to see dimmer events faster,” the company said in a press release. In August, Col. John Wagner, the 460th Space Wing commander at Buckley, said his unit was “already seeing improvements across the board with improved surveillance and warning” during the testing and evaluation phase of the Block 10 upgrades.